School presents one of the best platforms to gain experience. You can study, work, discover, and socialize in this place. To make yourself a better student, you may opt to write an academic appeal letter to gain the better perks of schooling. Many situations will require you to write such a letter. These go to writing a letter to ask for financial assistance, too. One of the most common examples is the reconsideration letter for failing the course. There is the whole plethora of them, each with different uses and reasons. You can write one yourself. But crafting the best letter takes practice. Because of this, you need to know what the parts are and how they work. Don’t worry. 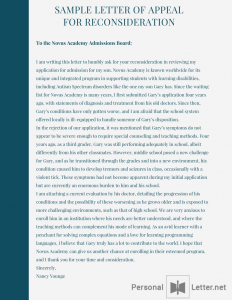 You can check the petition for readmission sample or letter the details down below to write the best academic appeal letter you can ever write. Keep it concise. You are writing an appeal. Not a novel. The last thing you want is the people reading your letter to consider it boring. When something drags on for too long, it becomes tiring to read. Be concise with your letter and include the important facts. Don’t tell the details of the story. State the important facts that back your appeal up. Keep your humility on. When writing this kind of letter, you request for their assistance. As such, you should be humble. You should not brag. Avoid sounding like they need you. In fact, you need them to consider your appeal. It’s like asking for a treat. You need to be humble to be considered worthy of the prize. This works especially when asking for reconsiderations and readmissions. Don’t be arrogant when writing your academic suspension appeal letter. State your case in a simple manner. If you need assistance, say why you need it. Do not overstate it. If you flood your letter with many unnecessary words, you end up to become arrogant. The people who you write your appeal to may have experienced the things you have. As such, they have the information they need to consider your case. Be simple. You need this for an academic dismissal appeal letter to be approved. Show how you will be worthy of their trust. When you write the letter, make sure you include the action you’ll take. The action can be anything that shows your devotion to work and contribute. You should answer the question “what can you offer in return?” in the letter. With this, you show humility. This also shows your determination. Go ahead and make it shine. Why Do You Need a Basic Structure? In essence, the basic structure helps you organize your thoughts. Writing without a structure can cause your ideas to jumble. When they get mixed around, the readers will lose the content of your letter. You should definitely avoid this. Following a basic structure will give you that assurance. Moreover, a basic structure is like a canvas for you to paint on. You just have to place your thoughts in order and write them accordingly. You can find a sample letter of appeal for reconsideration online and see that they follow the same flow. State who you are. Go ahead and present yourself. Say from which class and curriculum you came from. Properly addressing yourself is one way to earn the respect of the readers, more correctly, the admissions officers. Make sure you don’t come off too boastful. State what the appeal is for. Are you asking for financial assistance? Do you need help getting a job? Do you want to be readmitted to the college? You should make your reasoning clear. Don’t make the appeal vague or else they might miss it. Write the reasons why you should be considered. These things can be your accomplishments. In the case of readmissions, these can be the reasons why you missed school. State it concisely but firmly. This way, you improve the speed and ease of reading for the reader’s end. 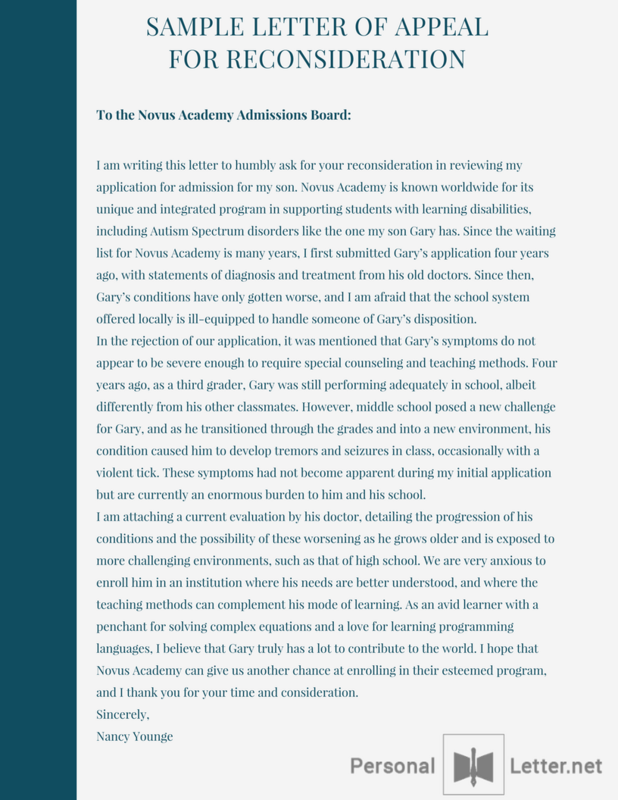 You can see a different sample academic dismissal appeal letter online. It will still contain this part. What action will you do for them? If you truly believe that you are worthy, you should state what you can offer in return for them. You can say that you will work hard, study hard, help the community, or even complete a project after you graduate. This will make them think that they are investing in something that can help them. Many people forget their schools after they complete their own programs. Don’t be one of them. You are advised to keep the flow like this. This will not confuse your readers. They’ll be able to understand what you write and you’ll get approved soon. Ensure the best kind of academic appeal letter falls to their desks! Get approved immediately with us!